Analysis of the crystallization kinetics of numerous polymers has revealed a bimodal dependence of the gross crystallization rate on temperature, often leading to the occurrence of two crystallization-rate maxima at widely different temperatures. 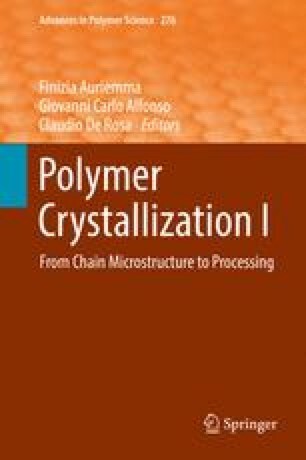 This review discusses possible reasons for this observation, including temperature-controlled changes in the mechanism of primary crystal nucleation, activation of growth at different crystal faces, and formation of different crystal polymorphs as a result of variation of the supercooling. It is suggested that crystallization proceeds via homogeneous crystal nucleation at high supercooling of the melt, which is supported by estimation of the nucleation density from morphological analyses, crystallization experiments performed on heterogeneity-free droplets, and a link between the time scales of molecular relaxations in the glassy state and primary crystal nucleation. The final part of this review presents an example of the application of Tammann’s nuclei development method to obtain nucleation rates in polymer glasses.